Frederick city being accessible to Gen. BANK'S army by railroad, the military depot and hospital have been removed from this town to that city. The government teams, to the number of one hundred and upwards, were engaged during the whole of last week in hauling away provisions, hospital stores, and other government property from this place to Frederick, and there is still some left to be taken down. 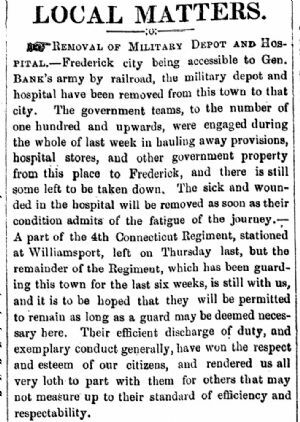 The sick and wounded in the hospital will be removed as soon as their condition admits of the fatigue of the journey,— A part of the 4th Connecticut Regiment, stationed at Williamsport, left on Thursday last, but the remainder of the Regiment, which has been guarding this town for the last six weeks, is still with us, and it is to be hoped that they will be permitted to remain as long as a guard may be deemed necessary here. Their efficient discharge of duty, and exemplary conduct generally, have won the respect and esteem of our citizens, and rendered us all very loth to part with them for others that may not measure up to their standard of efficiency and respectability.